I know I read this book a long time ago. Probably in grade school. And all I remembered from it when I came across this book in the children’s section of the library was that — Spoiler Alert — SOMEONE DIES. Our main character is fourth grader Jesse, a boy who is into sports and all the other typical boy stuff, in addition to having a sharp artistic talent. New girl Leslie has hippie parents and doesn’t seem to understand the social conventions of the fourth grade. She takes a shine to Jess and although at first he resists her, the two become BFFs. There’s no romantic stuff happening here – I think they are simply too young. Anyway, they go off into the woods and make up this imaginary place called Terabithia. It’s an escape for both of them from their lives which are less than ideal. And then Leslie screws it up by becoming deceased. This might be the first story your kids read that deals with death of a young person. (It was mainly for this reason that the book frequently appears on censored book lists.) 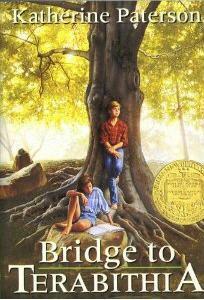 This is a Newbery Medal winner, so it’s a book worth reading no matter what age you are. If you remember this book from childhood I suggest you give it another go, especially if you’re a parent of kids who are likely to come across this book at some point during their studies.